My beautiful boy wants to read. He seriously wishes he could. He loves books - especially Roald Dahl and he brings them home from the school library every week. Plus he got a lovely set from his big sister Chelsea for Christmas and birthday. Plus he bought some second hand ones at Trash and Treasure. At the moment he has his beautiful gift copy of Fabulous Mr Fox, plus his crusty trash and treasure copy, as well as a copy from the library! I think that's a clear sign he'd really like to read Fabulous Mr Fox. As you know he has dyslexia, although he doesn't know that word. He just knows that his eyes aren't quite as fit as the rest of his body. So the messages he receives inside his brain during the reading process are a little different to the message you or I might receive. The words look different to the words we are seeing. The word FOX doesn't necessarily look the same each time he reads it ... it depends what other words are around it at the time. It makes it very hard to learn to read. As you know we did some extra work with him. We took him to some intense dyslexia therapy to try and retrain his eyes and get the incoming/outgoing signals aligned. It worked really well and his eye tracking is much improved. He still gets incredible eye fatigue and they do go haywire later in the week from overuse, but for the most part there is improvement. We have hope. I don't think we are cured, but there is hope. Diversion: this whole dyslexia thing is started to bother me greatly. Not the fact that he has it, but that it doesn't seem to be recognised as a "disability" requiring additional funding. To be honest I am torn - I don't want it to be labelled a "disability" because he has too many abilities to give him a label like that. No kid should have that label regardless of their extra needs. But if we want specialised attention the school needs the extra funding and to get the extra funding we need to have dyslexia recognised, and to get it recognised we need to have it labelled as a disability. I might be wrong, but that is the way I am perceiving it at the moment. I am going to QUIETLY be doing a whole lot more research and talking to a few Government people to get a handle on things. I say quietly because I don't want to make this a big thing for Darby. I don't want to single him out. But the reality is we live in a book based, reading based, society. To be able to answer a maths question you have to be able to read the question. To be able to learn your history and be tested on it, you have to be able to read it. If you can't read it doesn't make you less smart. It just means you can't read. It's very tricky when your eyes and brain messages work a little differently to everyone else's. Very tricky ..... especially when you are really clever and actually know all the answers ... it's just the reading and writing bit that lets you down. End Diversion. But yesterday .... yesterday was extra special. Yesterday he came home and opened his library copy. The bookmark was two pages ahead of our home copies. He'd had some quiet reading time at school and he'd read two pages on his own. I asked him what had happened in the storyline on those two pages and he was able to tell me. He had gone to school and he had read Mr Fox. You have no idea how proud I am. This is such a huge step. HUGE! 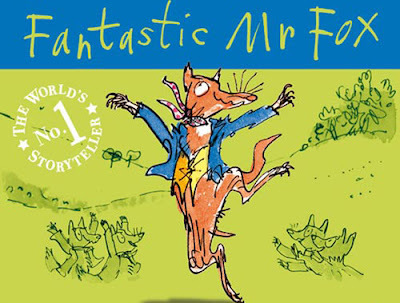 Thank you Mr Dahl, and thank you Mr Fox ... this truly is fabulous. I normally don't comment on blogs, but I just had to say - what a win for Darby and for his confidence! That is great. I actually had tears in my eyes. All the best. I am sitting here with the tears rolling down my face. Such a big and proud moment! Thanks so much for the lovely support guys. We are feeling pretty happy for our little man.